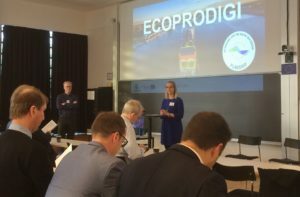 ECOPRODIGI project’s first public seminar “Heading towards digital and eco-efficient shipping in the Baltic Sea region” took place at the Aalborg University’s Sydhavn premises in Copenhagen on Tuesday the 20th of November. The seminar featured keynote speeches and panel discussions focusing on the two key themes of the project, eco-efficiency and digitalisation. 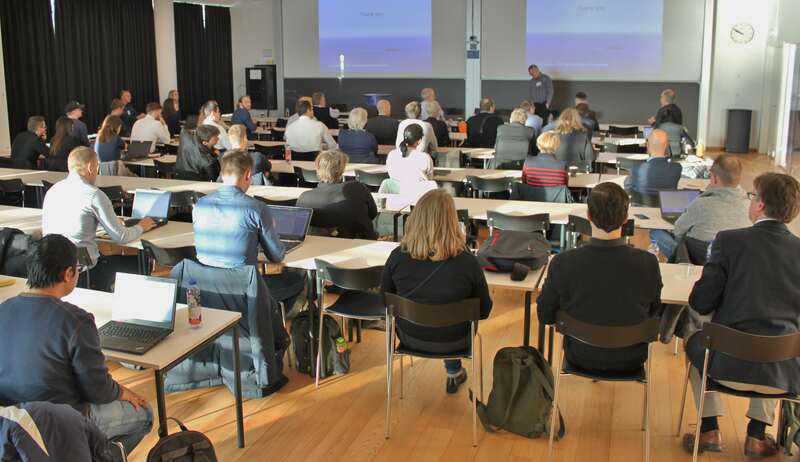 In addition, the objectives and preliminary findings of the project and its industry cases were also presented to the audience consisting mainly of researchers and industry end-users. The audience listening to Lars Jensen’s keynote speech. In his thought-provoking keynote speech, Lars Jensen (SeaIntelligence Consulting) discussed eco-efficiency and digitalisation challenges faced by the shipping industry and the role of digitalisation as an enabler for improved environmental performance. According to him, digitised data enables better transparency and digitalisation of processes can increase overall efficiency which, in turn, often leads to better environmental performance, especially if there is a regulatory framework enforcing the changes. The barriers hindering such development, however, are largely to do with issues such as traditional business processes, diverse supply chains, extensive legal regulations, and the nature of B2B markets. The question of digitalisation is therefore not only down to the overall level of technological development as the main obstacles are often encountered in the implementation processes. Furthermore, companies seeking to gain competitive advantage cannot rely on the technological side of digitalisation alone. A broader, service-centered mindset is needed for differentiation. The first panel discussion of the seminar focused on the impact of digitalisation on ship design, production and operations. The moderator Jakob Buus Petersen (Vessel Performance Solutions) and the panellists Jacob H. Thygesen (OSK Shiptech), Andrius Sutnikas (Klaipeda Science and Technology Park), Åsa Burman (Lighthouse, Swedish Maritime Competence Centre), Michele Acciaro (Kühne Logistics University) and Jukka Merenluoto (DIMECC) discussed the drivers and the nature of digitalisation in the shipping industry. The panellists largely agreed that the smaller industry players are currently paving the way to digitalisation. However, the lack of interfaces was raised as one of the main challenges impacting the development. Supply chain management was seen as crucial in understanding the scope of operations and in achieving system-level integration. In addition, the panellists emphasised the needs of the market and the role of regulations as the main drivers of the development. 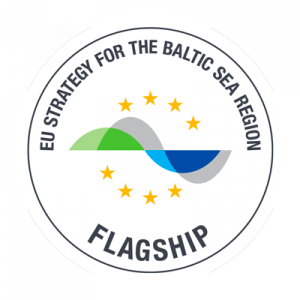 Markus Helavuori (HELCOM) delivered the second keynote speech which focused on the impact of environmental regulations in the Baltic Sea region. He noted that as shipping has continued to grow as means of transport, the emissions from shipping have also been on the rise and this trend is likely to continue. Reduction measures are therefore inevitable, as indicated by the recent actions by the International Maritime Organization. Visions to phase out airborne emissions from shipping have received increased regulatory attention as demonstrated by measures such as the Baltic Sea becoming a Sulphur Oxide Emission Control Area (SECA). However, in addition to airborne emissions, other critical aspects demanding more attention in terms of regulations include issues such as ballast water, marine litter, grey water and under water noise. Change in practices is often slow but some progress is being made. The seminar ended with a final panel discussion which revolved around the topic of enablers and barriers for sustainable maritime industry. The moderator Poul Woodall (DFDS) and the panellists Ilaria Barletta (Chalmers University), Valdemar Ehlers (Danish Maritime), Tuomas Riski (Norsepower), Kaapo Seppälä (University of Turku) and Sofia Fürstenberg Stott (Nor-Shipping) engaged in a lively discussion on how sustainability should be perceived and promoted. While some emphasised the need to see sustainability as a clear business case, others noted that there is also a need for measures such as taxation, finance and regulation to push the industry towards more sustainable practices. Better dissemination of results was mentioned as essential to attract more public investment in sustainable shipping. It was also noted that the scope of sustainability in the maritime industry should to be wide enough to incorporate all the relevant stages from shipbuilding to shipping and port activities.